Nobody ever in the history of the world has ever said moving is easy and the true cost of moving might actually surprise you. Whether it’s across town or across the nation there are many logistics involved in the moving process. Along with those logistics come expenses which can vary greatly. In today’s article The True Cost of Moving we’ll help you with understanding the costs of moving and what to watch out for. Buying a new home and moving to a new place is always an exciting time. Add the thoughts of actually packing and moving and for some people they’d rather just stay put in the home they have. Questions like: is this truly the best move for me? How are the schools on the area? Is the neighborhood better than my current one are always on ones mind when making the decision to move. Did you know that approximately 11% of people in the USA moved in 2016 due to housing, employment and familial changes? One common question they all asked was what is the average cost to move? Whether you’re relocating for a new job or your company is moving you to another area it’s important to know what costs will be involved. Items like cost of living changes, paying for two mortgages and the moving cost of getting your items from here to there are all costs that must be weighed in to get an accurate number. When moving, most people choose to hire professionals. Obviously the cost is higher than moving the items yourself but there are many upsides to hiring professional movers. Costs vary by area but below is the average costs to hire a professional moving company. Most people just move across town, in fact, Zillow reports that 57% of home buyers just move within the same city. Planning is also a very critical part of moving regardless of distance. If you’re planning to hire a moving company then you’ll want to contact them as soon as possible and no less than 4 week in advance. 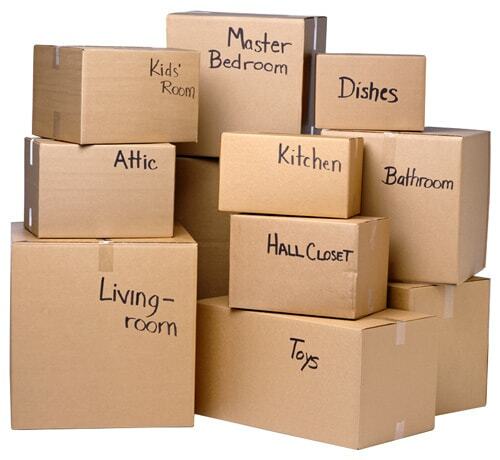 The moving company will come and review the items you have and give you a proposal as to what the cost will be. The earlier you choose to contact the moving company and book your move the better off you are and the more likely you will be to get the day you need for moving. The cost of getting your items from point A to point B will vary. Costs can differ by region and items like the weight of your belongings and the distance the items are being moved will be the two factors used for the moving companies to determine the cost. Additionally, if you’re moving outside your immediate area make sure to discuss with the moving company the additional costs like fuel charges, tolls and lodging. Truck Rental – Most people find that renting a truck from uHaul based on the size you need is the best bet. Most trucks come with loading ramps and vary in price by size. Temporary Storage – If you’re downsizing you may find your new place doesn’t fit all your stuff. if you don’t like the idea of getting rid of anything then a self storage might be the ticket. Moving Supplies – The right tools will make your moving project much easier! Items like packing tape, boxes and packing wrap are all available at the uHaul or online at Amazon. Beware of the small print when selecting a moving company to move your items. Things like moving vehicles, boats and motorcycles can be additional costs if the movers will even agree to move the items. Fragile belongings like pianos, glass items and extra large furniture will also likely incur additional costs. Lastly when hiring a moving company be aware of the loading dynamics; is the truck more than 70 feet from the front door? Are there stairs or other inhibiting items? Is your street to narrow for a full size moving truck i.e. will the movers have to load a smaller truck and then take the items and load them into a larger truck somewhere else? All these items are circumstances where you will likely incur additional charges. The most important tip to be mindful of to ensure the lowest costs when determining The True Cost of Moving is to move fast. Unless you’re doing the packing and moving yourself this is not the time to chat and make friends with the movers. At rates of $80-$100 per hour you may even want to help move some of the boxes with your movers. If you’re looking to sell your home in Bakersfield CA we’d appreciate the opportunity to meet with you and show you how we’ll sell your home for top dollar in the least amount of time. Our clients even received the added benefit of our reduced commission program that’s only 1.9%! Click here to learn more about or reduced commission program. Hopefully this article, The True Cost of Moving has given you some insight and will help you be better prepared when it comes to moving. If you have any questions or would information about listing your home for sale please contact us anytime.